This watercolor and ink sketch was done from the roof of our town's parking garage. I loved painting the trucks. 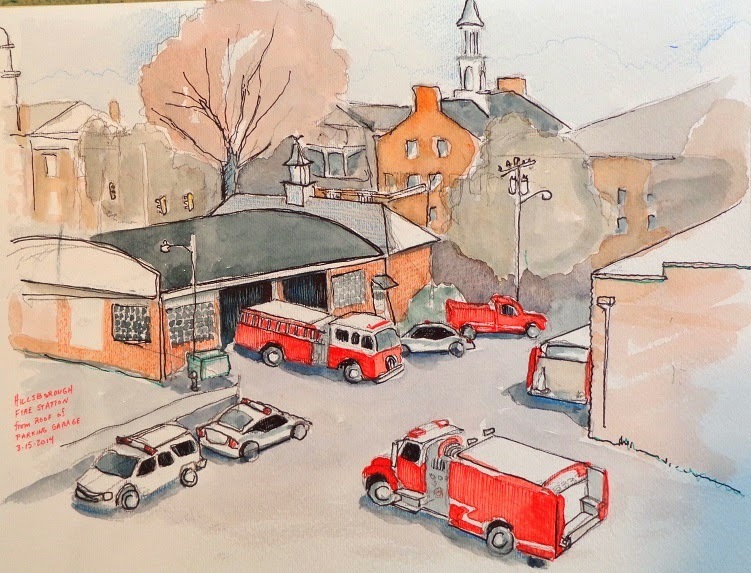 The fire department kept moving them as I sketched - so this particular arrangement of the trucks never existed in reality... For instance, the truck in the foreground and the truck mostly behind the building on the right is the same truck, and the white SUV was also moved during the course of the drawing time. The police car in the background left half-way through the time I was there. When I began, the ladder truck was still in the garage, not pulled most of the way out. So this is a bit like a multi-exposure, time-lapse image. Hi Steve, This is a really nice painting to look at in its larger size. The colors are all low-key and very sophisticated and the layout of the vehicles most harmonious. The details add that extra sense of realism despite this not being exactly the scene at any single moment. Thanks, Susan! I had the best fun drawing those trucks.